I bet you all thought I was going to share a cool recipe that I baked today. Ha, the only thing that is baking around here is me. 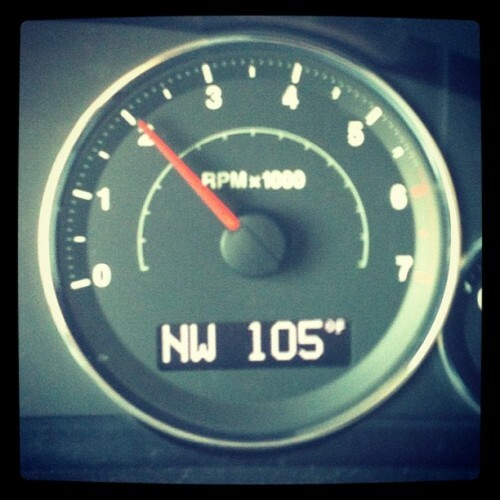 Yes, my friends, it was 105 degrees here this afternoon. Now, don't get me wrong, I love summer, but this might be a hint that the next few days will be good stay inside days. Now, the thing about the wasps. I certainly don't deny wasps the right to be in this universe, but I do deny them the right to be in my van. I pulled up in the driveway to unload my purchases, and as soon as I opened the door, five wasps flew in. All I can say is I hope the UPS driver that pulled up across the street just then didn't have a video camera, because I do not want to find myself on You Tube screaming and batting wasps with my cane. It is not how I want to be remembered. If you happen to be looking for me, I'll be the person with their head stuck in the freezer. Oh my gosh, five wasps! Wasps are kind of evil. I'd be flailing at them too. Also hot here. "Only" 96, but the heat index is 111. That's hot for us northerners! I don't know whether to say, "Oh No!" over the wasps or the 105 degree heat! lol Neither of the two appeal to me! Try to stay cool, Laura. I feel panic setting in just reading this, Laura! Did they sting you? I can't figure out if your head is in the freezer due to the heat or wasp stings! I hate wasps, they ruin summertime around here. Hope they didn't getcha'! Stay cool Laura and away from those stinging beasts! (( big hug)) . Stay inside, k? We were only at 102 degrees here today. Can't believe I just said that. We are roasting. Oh wasps scare me. Once when I was 14, I saw a wasp in the bathroom where I was by the mirror. I ducked down fast, and then it was gone. So I went about my day, and within a few hours or so, it flew out from the back of my neck, where it had been perched inside the neck of my blouse. Uhghhha. What a scare. Glad you had a chance to get out and about! Sorry about the dang wasps....I don't like them either but I just might have to search YouTube for 'lady with cane battles wasps'~LOL!